Depression is not a normal part of aging, although older adults are at an increased risk for experiencing depression. Depression is not just having “the blues” or having emotions related to major life events (e.g. mourning over the loss of a loved one, retirement, etc.). 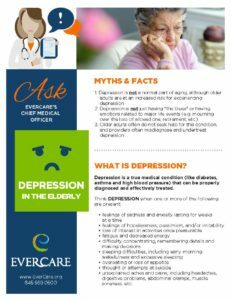 Older adults often do not seek help for this condition, and providers often misdiagnose and undertreat depression. Depression is a true medical condition (like diabetes, asthma and high blood pressure) that can be properly diagnosed and effectively treated. unexplained aches and pains, including headaches, digestive problems, abdominal cramps, muscle soreness, etc. HOW MANY OLDER ADULTS ARE DEPRESSED? Although it is estimated that about 1-5% of the elderly living in the community are depressed, this figure dramatically rises to 12% in those requiring home or hospital health care. If you are concerned about a loved one, offer to go with him or her to see a health care provider to be diagnosed and treated. If he/she is in “crisis,” immediately call 911 or visit a nearby hospital’s emergency department.